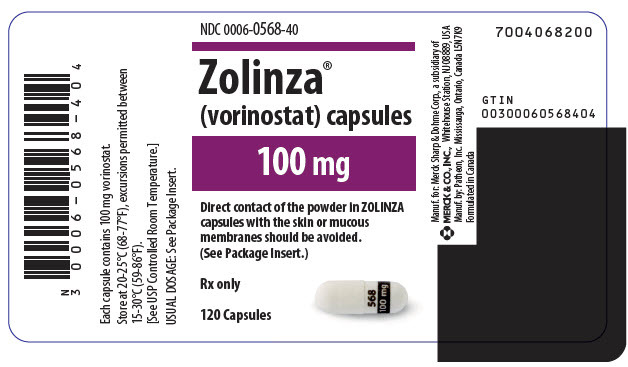 ZOLINZA was studied in 42 patients with non-CTCL cancer and varying degrees of hepatic impairment after single and multiple-dose administration. Compared to patients with normal liver function, AUC increases of 50 to 66% were observed in patients with hepatic impairment. The incidence of Grade 3 or 4 thrombocytopenia increased in patients with mild (bilirubin of 1 to 1.5 × ULN and AST < ULN, or bilirubin ≤ ULN and AST > ULN) and moderate (bilirubin 1.5 to ≤ 3 × ULN) hepatic impairment treated daily at doses of 300 and 200 mg respectively. A randomized, partially-blind, placebo-controlled, 2-period crossover study was performed to assess the effects of a single 800-mg dose of vorinostat on the QTc interval in 24 patients with advanced cancer. This study was conducted to assess the impact of vorinostat on ventricular repolarization. The upper bound of the 90% confidence interval of the placebo-adjusted mean QTc interval change-from-baseline was less than 10 msec at every time point through 24 hours. Based on these study results, administration of a single supratherapeutic 800-mg dose of vorinostat does not appear to prolong the QTc interval in patients with advanced cancer; however the study did not include a positive control to demonstrate assay sensitivity. In the fasted state, oral administration of a single 800-mg dose of vorinostat resulted in a mean AUC and Cmax and median Tmax of 8.6±5.7 µM∙hr and 1.7±0.67 µM and 2.1 (0.5-6) hours, respectively. The pharmacokinetics of vorinostat were evaluated in 23 patients with relapsed or refractory advanced cancer. After oral administration of a single 400-mg dose of vorinostat with a high-fat meal, the mean ± standard deviation area under the curve (AUC) and peak serum concentration (Cmax) and the median (range) time to maximum concentration (Tmax) were 5.5±1.8 µM∙hr, 1.2±0.62 µM and 4 (2-10) hours, respectively. In the fasted state, oral administration of a single 400-mg dose of vorinostat resulted in a mean AUC and Cmax and median Tmax of 4.2±1.9 µM∙hr and 1.2±0.35 µM and 1.5 (0.5-10) hours, respectively. Therefore, oral administration of vorinostat with a high-fat meal resulted in an increase (33%) in the extent of absorption and a modest decrease in the rate of absorption (Tmax delayed 2.5 hours) compared to the fasted state. However, these small effects are not expected to be clinically meaningful. In clinical trials of patients with CTCL, vorinostat was taken with food. At steady state in the fed-state, oral administration of multiple 400-mg doses of vorinostat resulted in a mean AUC and Cmax and a median Tmax of 6.0±2.0 µM∙hr, 1.2±0.53 µM and 4 (0.5-14) hours, respectively. The major pathways of vorinostat metabolism involve glucuronidation and hydrolysis followed by β-oxidation. Human serum levels of two metabolites, O-glucuronide of vorinostat and 4-anilino-4-oxobutanoic acid were measured. Both metabolites are pharmacologically inactive. Compared to vorinostat, the mean steady state serum exposures in humans of the O-glucuronide of vorinostat and 4-anilino-4-oxobutanoic acid were 4-fold and 13-fold higher, respectively. The single dose pharmacokinetics of a 400 mg ZOLINZA dose was evaluated in patients with non-CTCL cancers with varying degrees of hepatic impairment. The mean AUC of vorinostat in patients with mild (bilirubin > 1 to 1.5 × ULN or AST > ULN but bilirubin ≤ ULN) and moderate (bilirubin 1.5 to ≤ 3 × ULN) hepatic impairment increased by 50% compared to the AUC of vorinostat in patients with normal hepatic function. The mean vorinostat AUC in patients with severe hepatic impairment (bilirubin > 3 × ULN) increased by 66% compared to the AUC of patients with normal hepatic function. Vorinostat is not an inhibitor of CYP drug metabolizing enzymes in human liver microsomes at steady state Cmax of the 400 mg dose (Cmax of 1.2 µM vs IC50 of >75 µM). Gene expression studies in human hepatocytes detected some potential for suppression of CYP2C9 and CYP3A4 activities by vorinostat at concentrations higher (≥10 µM) than pharmacologically relevant. Thus, vorinostat is not expected to affect the pharmacokinetics of other agents. As vorinostat is not eliminated via the CYP pathways, it is anticipated that vorinostat will not be subject to drug-drug interactions when co-administered with drugs that are known CYP inhibitors or inducers. However, no formal clinical studies have been conducted to evaluate drug interactions with vorinostat. Treatment-related effects on female reproduction were identified in the oral fertility study when females were dosed for 14 days prior to mating through gestational day 7. Doses of 15, 50 and 150 mg/kg/day to rats resulted in approximate exposures of 0.15, 0.36 and 0.70 times the expected clinical exposure based on AUC. Dose-dependent increases in corpora lutea were noted at ≥15 mg/kg/day, which resulted in increased peri-implantation losses at ≥50 mg/kg/day. At 150 mg/kg/day, there were increases in the incidences of dead fetuses and in resorptions. In an open-label, single-arm, multicenter non-randomized study (NCT00091559), 74 patients with advanced CTCL were treated with ZOLINZA at a dose of 400 mg once daily. The primary endpoint was response rate to oral ZOLINZA in the treatment of skin disease in patients with advanced CTCL (Stage IIB and higher) who had progressive, persistent, or recurrent disease on or following two systemic therapies. Enrolled patients should have received, been intolerant to or not a candidate for bexarotene. Extent of skin disease was quantitatively assessed by investigators using a modified Severity Weighted Assessment Tool (SWAT). The investigator measured the percentage total body surface area (%TBSA) involvement separately for patches, plaques, and tumors within 12 body regions using the patient's palm as a "ruler". The total %TBSA for each lesion type was multiplied by a severity weighting factor (1=patch, 2=plaque and 4=tumor) and summed to derive the SWAT score. Efficacy was measured as either a Complete Clinical Response (CCR) defined as no evidence of disease, or Partial Response (PR) defined as a ≥50% decrease in SWAT skin assessment score compared to baseline. Both CCR and PR had to be maintained for at least 4 weeks.